Leslye is a wonderful teacher, a brilliant technician and designer. She is most know by many for her well-photographed and studio-produced videos are of the following titles: The Hand-Knitter's Guide to Sweater Finishing, The Absolute Best Way To Learn How To Knit, The Hand Knitter's Guide to Buttonholes and Bands, The Hand Knitter's Guide to Making Socks, and The Hand Knitters Guide to Making Socks on a Single Circular Needle. Her book entitled, The Uncomplicated Knitting Machine, is a book used by many fashion design institutions and hand and machine knitters all over the world. This book, frequently referred to as the "knitting machine bible" although written for machine knitters, has been used by anyone who wants to create one's own sweater ideas. 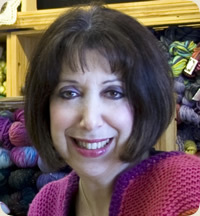 Leslye Solomon is most know by many for her well-photographed and studio-produced videos are of the following titles: The Hand-Knitter's Guide to Sweater Finishing, The Absolute Best Way To Learn How To Knit, The Hand Knitter's Guide to Buttonholes and Bands, The Hand Knitter's Guide to Making Socks, and The Hand Knitters Guide to Making Socks on a Single Circular Needle.